If you are unfortunate enough to drop or spill something on your carpet your first reaction is normally to grab the nearest cloth to wipe it up. After this some may decide to reach for an “under the kitchen sink” household cleaner. 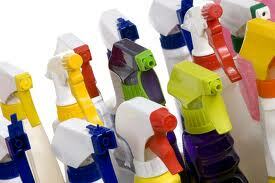 These cleaners are marketed in our supermarkets as “all in one” cleaners or “stain removal” cleaners for carpets. Unfortunately theses products aren’t magic in a can. Some may contain harsh chemicals which could actually “lock” the stain in the carpet, potentially ruining it. Professional cleaners stay well clear of these sorts of products. We see on a regular basis the damage these wonder products cause. Carpet dyes in some carpets can be very delicate especially in wool and some nylon carpets. Some of these products contain harsh chemicals which if left can quickly cause colour loss, where a light patch occurs when dry. The products have literally bleached the colour out of the carpet dye, this then cannot be fixed and is permanent. Don’t make the common mistake that you can see a clean patch as it could well be that it is the colour that has varnished! Have you ever wondered why when you clean a patch it gets dirty quicker? Most of the supermarket products are detergent based and because many don’t rinse the product after cleaning leaving residues behind. Dirt will attract back to the sticky residues like a magnet. Imagine washing your hair but not rinsing it out afterwards, the same applies. In an attempt to remove the stain many people just scrub away at the fibres. Whilst it may not harm some carpets, there are some where rubbing can seriously damage the fibre. This can cause distortion, piling and damage fibre rigidity. Rubbing stains can often spread the stain further into the carpet. After attempting the stain removal, but being unsuccessful, you’ll be considering calling a professional in. With the hope “he’ll be able to sort it out”. Unfortunately these magic products can literally “lock the stain” in the carpet by physically altering the chemical structure of the stain. Remember after calling in a professional carpet cleaner it may now be impossible for them to remove.